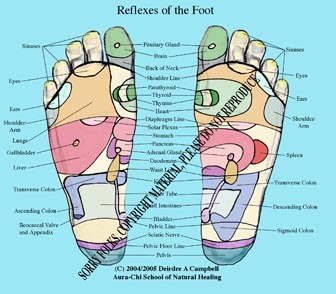 Holistic Foot and Hand Massage is a wonderful combination of basic reflexology techniques and Ayurvedic Massage using Marma Points, (Marma Points are the Ancient Indian Ayurvedic equivalent to reflexology or acupuncture points). Reflexology and Marma Point massage is gentle but highly therapeutic. It stimulates the reflexes releasing toxins and unblocking energy centres, allowing healing to take place. Remarkable results can be achieved with many ailments including back pain, insomnia, migraine, depression, sinus, stress, insomnia etc. These Massages can take place on a massage table, a reflexology chair, a normal household chair, a wheelchair, a bed or simply a folded doona on the floor. A session can take anywhere from 30 minutes to an hour to complete, depending whether you are doing a stimulating massage, or a pampering session. Many people are unable to partake of a "normal" massage on a massage table. These non-intrusive forms of massage are ideal for the aged, the infirm, and those simply unable (or unwilling) to disrobe and lay on a massage table. At the completion of this course you will have achieved not only the ability to give the ultimate Foot and/or Hand Massage, but the knowledge of how to help people with a variety of ailments, through Reflex-based Massage. This is an excellent course for Beauty Therapists, Massage Therapists, Diversional Therapists, Healers, etc., who wish to further their studies, or for people who may be interested in reflexology, but not wanting to undertake a more lengthy and complex course. An Holistic Foot and Hand (Reflexology) Massage Certificate will be presented. 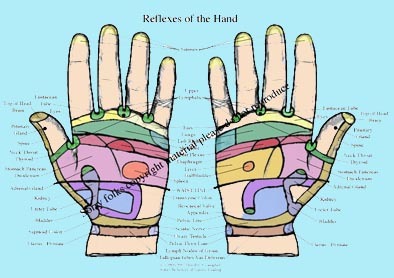 Please note this is not a standard “Reflexology” Course but an integration of general massage & relaxation techniques, reflexology, traditional Ayurvedic techniques, and hands on healing. The course takes place on two Saturdays or Sundays - 10.00 am to 6.00 pm - in Menzies Creek. Students catching public transport can be collected from Belgrave railway station if required. A bus (number 695) also runs to the bottom of our street. Comprehensive handbook and therapeutic Young Living essential oils are provided for the course. No previous experience in healing or massage is necessary for this course. It takes place in an extremely relaxed and friendly environment and numbers are intentionally kept to a minimum to ensure maximum personal attention. This is a very hands-on course and every student is given every opportunity not only to give, but to receive wonderful massages. For further information – (i.e. future course dates, more details about the course and a registration slip) – please let us know your email or postal your address, or free free to ring us. Note that this is a Certificate Level course. However, if one continues on and completes the required contact hours, one is able to sit a Practitioner Assessment, which if successful, entitles you to a Practitioner Certificate. This Practitioner Certificate is Industry accredited, enabling you to join the IICT Natural Therapy Association, and be able to obtain Professional Indemnity Insurance. Saturday morning - getting to know each other, theory, and making your own personal massage oil blend. After lunch it is all hands-on. which on successful completion qualifies the student as a Practitioner of Holistic Foot and Hand (Reflex) Massage - an Industry Accredited qualification..
most of all though you give whole heartedly of yourself and that is the true gift! "You Know You're in the Right Hands"